Renal imaging in posteroanterior position (R = right kidney, L = left kidney). A. 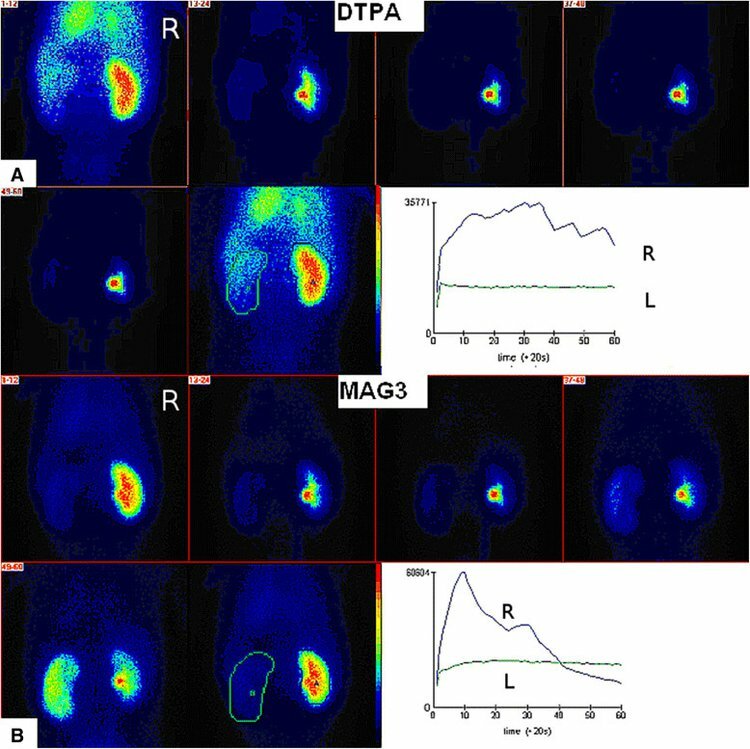 99mTc-DTPA renal scintigraphy shows vascular bed over the left kidney without visualization of the parenchyma with practically afunctional renographic curve of the same kidney. B. 99mTc-MAG3 scintigraphy shows very pale left kidney becoming increasingly better visualized later. Renographic curve of the left lidney shows obstruction over the third phase of the renogram. A Renal Scintigraphy procedure involves the kidneys and structures associated with kidneys such as the renal arteries. Why is the Renal Scintigraphy radiology procedure Performed? A Renal Scintigraphy is used to diagnose a variety of medical conditions affecting the kidney structure and function. There have been no recent advances in the Renal Scintigraphy procedure. What is the Cost of performing the Renal Scintigraphy radiology procedure? The cost of Renal Scintigraphy procedure depends on a variety of factors, such as the type of your health insurance, annual deductibles, co-pay requirements, out-of-network and in-network of your healthcare providers and healthcare facilities. How does the Renal Scintigraphy radiology procedure work? How is the Renal Scintigraphy radiology procedure Performed? A Renal Scintigraphy procedure is usually performed as an outpatient procedure at a hospital. Renal Scintigraphy is performed as an outpatient procedure, at a hospital. A radiology technologist performs the Renal Scintigraphy procedure, under the supervision of a radiologist. Depending upon the type of procedure being performed, a Renal Scintigraphy may take 30 minutes to four hours. A radiologist interprets the results of the Renal Scintigraphy procedure. A physician will request your consent for Renal Scintigraphy procedure using an Informed Consent Form. What are the Limitations of the Renal Scintigraphy radiology procedure? What is a Renal Scintigraphy procedure? What is to be expected during the Renal Scintigraphy radiology procedure? No anesthesia is used during the Renal Scintigraphy procedure. Since the Renal Scintigraphy procedure is a non-invasive one, no blood is lost during the procedure. What are the possible Risks and Complications during the Renal Scintigraphy radiology procedure? The radioisotope material may cause severe allergy reactions in some patient populations, during the Renal Scintigraphy procedure. What Post-Operative Care is needed at the Healthcare Facility after the Renal Scintigraphy radiology procedure? No specific post-operative care is needed at healthcare facility after the Renal Scintigraphy procedure. What is to be expected after the Renal Scintigraphy radiology procedure? If the patient develops an allergic reaction, such as redness, itching, warmth, or swelling around the area of radioisotope injection accompanied by high fever, then they may need to call their physicians. What Post-Operative Care is needed at Home after the Renal Scintigraphy radiology procedure? No specific post-operative care is needed at home after the Renal Scintigraphy procedure. Renal Scintigraphy is a noninvasive procedure that does not require any recovery period. Individuals may resume their normal activities immediately after the procedure. Renal Scintigraphy procedure does not involve the removal of any body tissue. Since no tissue is removed during the Renal Scintigraphy procedure, a pathologist does not get involved in the care of the patient. Who will you receive a Bill from, after the Renal Scintigraphy radiology procedure? The patient is advised to inquire and confirm the type of billing, before the Renal Scintigraphy procedure is performed.